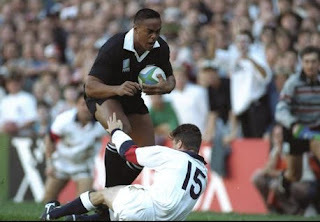 The 6ft 5in giant All Blacks legend regarded as one of New Zealand’s greatest wingers, had suffered from health problems due to a rare kidney disease and passed away aged 40 on Tuesday night Nov. 16th. In 1995 he was diagnosed with nephrotic syndrome, a serious kidney disorder forcing him to put his rugby playing career on hold while he was treated. He scored 37 tries in his international career which saw him play 63 test matches. He became the youngest All Black test player at the age of 19 years when he played against France in 1994. He recently was in England to watch his beloved All Blacks lift the Rugby World Cup.